If you want to experience the fishing with more pleasure and relaxation, then Ace Fishing: Wild Catch APK 2.3.0 is the perfect option for you. 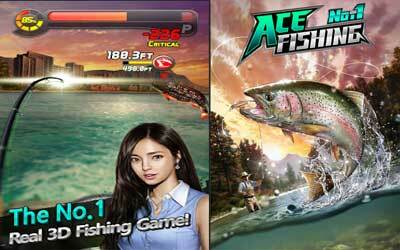 If you are unable to go to a place doing your hobby of fishing, what you need is just to play this Ace Fishing game. This game is very popular among gamers around the world. Like its name, it provides a game that allows you to catch many different fishes such as pike, gold fish, up to tropical fish in various places. You can fish in many colorful locations such as ponds, rivers, or in the oceans to get the more exotic fish. This game allows you to sell the fish you have caught. Moreover, you can also join the global fishing tournament. It is easy to control this fishing game using one touch control while you wait for fish to be caught up in your bait. This makes you being able to master the fishing technique easily like a competent one to win a lot of rewards available in the game.